I bought a couple of pieces online back in Autumn and absolutely loved them, although I was a but nervous about branching out without trying stuff on, as I absolutely hate online returns with a passion. So, on a recent trip to Glasgow for a Punky Mums Meet Up I took the opportunity to nip into the recently opened store. I was in absolute heaven. I didn't have loads of time as we had to get back on the road to Newcastle and everyone was suffering with hangovers from the night before, but I grabbed everything I could and headed for the changing rooms. 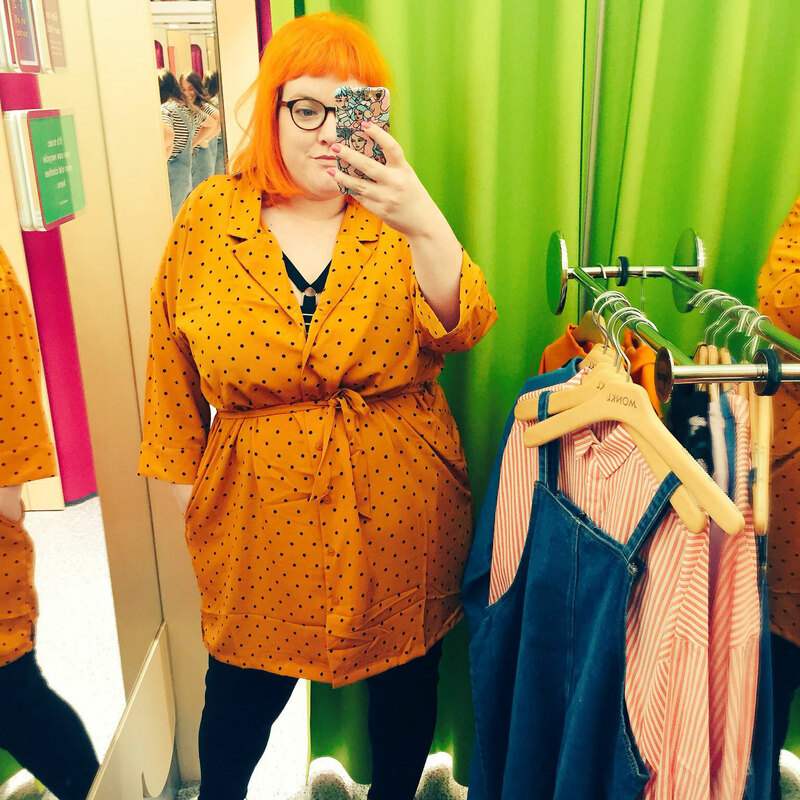 While there were quite a few things that didn't fit or look right on me, I did find some gems which I would never have dared to buy online, like this mustard polka dot shirt dress, which is a firm favourite for my work wardrobe. I also bought the orange sweater above and honestly kind of wished I'd splurged on the leopard jumper too. What is Mum Style I hear you ask? Well, becoming a mother is a really weird time, you sort of lose your sense of self in the beginning and it can be quite hard to get back to the person you were before, or even find time to think about your own appearance. I mean we've all been that mum at softplay in old jeans and a hoody with your kid dressed like a tiny Boden model right? No just me? I have really tried recently to make time for me, now Zoe is a bit older I am making time for self care, and feel like rather than getting back to who I was before I am this new improved me, with a cool little sidekick. So, hence my foray into fashion blogging, I hope you'll forgive the detour and appreciate me learning to love myself a little, and hopefully it might inspire you a little too. Remember self care is never selfish, you can't pour from an empty cup. I’m obsessed with monki, so many great pieces and I love the sizing. Love that polka dot dress on you!!! I really hope they open a Newcastle store soon, I never buy from H&M for myself (their kids clothes are amazing) as the sizing is just so ridiculous even in the plus size bit. I was in Glasgow! Just for one night though sadly. Is that close to you? Its a beautiful city.